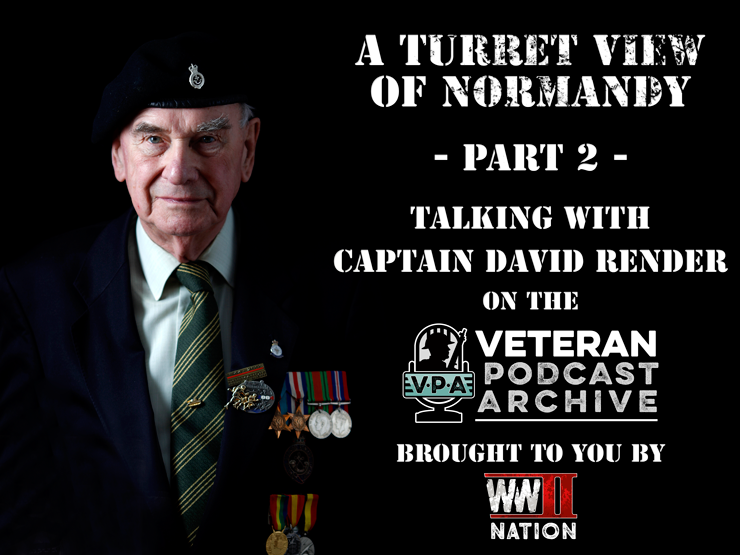 In this episode, Part 2 of A Turret View of Normandy, we rejoin Captain David Render of the Sherwood Rangers Yeomanry as he recalls the bitter reality of life and conditions inside a Sherman Tank during the Second World War. In this session we learn about the horrific casualties sustained by the Regiment as they fought their way through the Normandy bocage and towards Germany, and just to give you an idea of what David faced during this period, the average life expectancy of a Tank Commander was just two weeks. We also discuss the tactics employed by both sides, the constant threat from snipers in the bocage, a first encounter with a Panzerfaust, losing a tank on mines, a few tricks of the trade that helped keep David and his crew alive, Operation Pepperpot and much much more. We do hope you have found this episode of interest. The Third and final part of this interview we did with Captain Render will be released very shortly. In this we found out about the differences between the Allied and German Tanks, the German Tiger and Panther’s vulnerability, the issues the Germans had with fuel, how best to force the German Tanks out of hiding and the way in which David would employ his troop to deal with this threat, we also learn about a friendly fire incident with Hawker Typhoons and the reality of mail and post on the front line. If you know somebody, a relative or friend perhaps who served during the Second World War and is willing to talk with us about their experience, please do feel free to get in contact via our website contact us form. A big thank you to David for speaking with us about his experience and also to you, thank you for listening and for all your support! Missed our previous interview talking with veteran Captain David Render? Listen to Part 1 Here. Photo Credit – The main cover image of Captain Render was kindly provided with permission from David, Stuart Tootal and Orion Books from his new book about his WW2 experience Tank Action.